Yeah, but: Worst marketing use of the word 'Digital' EVAR. The Long Version: A high-quality mechanical cable release is something that I've been looking for without any real expectation of success. These are for cameras with threaded shutter buttons, which lets an inexpensive mechanical remote to do the exact same job as an expensive electronic one. For those not familiar with the type, it's a flexible wire that slides inside a guide tube with a screw-attachment on the end, which can trip the camera shutter with very subtle pressure. This is a fairly standardized thing, but what makes the Hama Cable Release special is that it has a very supple fabric covering. Most camera stores around here have one with the wire moving inside a heavy plastic tube, which isn't nearly as good at isolating the camera from movement. The Hama's greater flexibility also makes it easier to pack in the camera bag and easier to use. The mechanics are really quite simple. It has a locking mechanism, easily disabled and activated, for shooting in bulb mode; it even triggers my Yashica GSN, which the prolific plastic model wouldn't do. And while I'm in a good mood, I'd also like to add that I found this one at FilmPlus in Toronto's west end for substantially less than what B&H charges. I'll have more to say about them in a few more weeks, but essentially they're a rental and pro-support shop that's completely different from the electronics retailers that most camera stores have become. 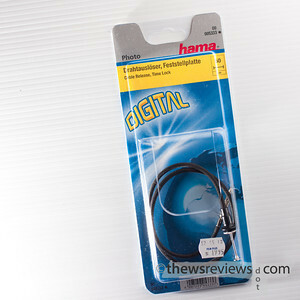 The truly ridiculous thing about the Hama Cable Release is the huge word "DIGITAL" screaming across the package. (Seriously, is it still 1993?) Not only is this a thoroughly analogue device, you'd have a very hard time finding a digital camera that can use a mechanical shutter release. The only ones I've tracked down are directly based on archaic manual-focus film cameras (RD1, M8, M9); even the Leica X1 uses an electronic remote. So if you have a digital camera, this remote almost certainly won't work for you. If you have a film camera, it probably will. Grudgingly updated, 21 September 2010: Naturally, two days after I wrote this, Fujifilm has set the internet on fire with its rangefinder-styled X100 concept camera. It has a threaded shutter release. As Apple said back in 1991, sosumi. I think I'll hack my XTi so it can use that DIGITAL device, there.